Social bookmarking is one of my favorite online marketing activities. Sure, it enables me to digitally bookmark excellent content so I can return to it easily any time I want to. But even better, social bookmarking allows me to share my own content and instantly drive massive traffic to it. 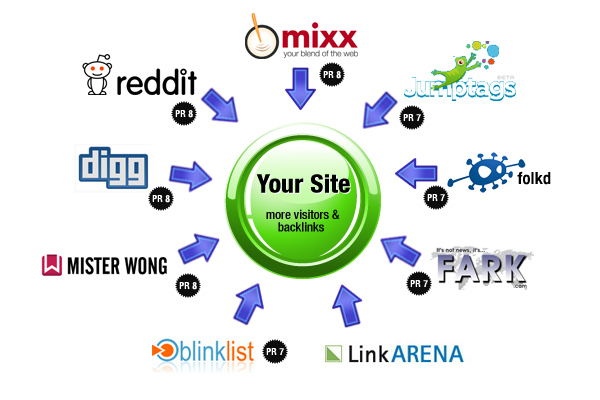 Essentially, social bookmarking sites are also social networking sites. They offer users the opportunity to connect and interact with other users. This benefits your content when you save it on social bookmarking sites, because it enhances your find-ability not only in the social space, but also in search. In this post, I’ll discuss some of the basics of how to use social bookmarking for your online marketing campaigns. Social bookmarking sites assess the links saved by their users and analyze the patterns to determine which bookmarked content are more popular and which should be displayed to users according to their interests. Tagging plays a central role in social bookmarking. It consists of subject-based keywords that users assign to their saved links so they can be easily categorized. By tagging, you make it simple for other users to find your content. To make the most out of social bookmarking, you want to be sure to employ some of the most widely used and most popular websites. Not only will that ensure that your content will be found by the greatest number of people, but you will also be assured that your content are linked from only the most authoritative sites. Some of the most popular and biggest social bookmarking sites include StumbleUpon (a personal favorite of mine), Reddit, and, of course Twitter. Formerly popular social bookmarking sites include Digg, which unfortunately seems to have lost its luster and fallen by the wayside. Among the social bookmarking sites listed above, I have a strong personal preference for StumbleUpon. With StumbleUpon, and its Twitter app called Su.pr, I was able to drive massive traffic to my affiliate marketing pages. Digg, on the other hand, is more of a news / social bookmarking site. Newsworthy content gets preference over other forms of content in Digg. But if you can manage to make a news item out of your content and it’s interesting enough to other folks, there’s a good chance that your content will end up in Digg’s front page, which could result in millions of page views. To help you decide which social bookmarking site is right for the type of content you wish to promote, below is a quick overview of each of the most popular ones. Social bookmarking is continually evolving. One of the more recent developments has been the rise of bookmarking sites for images and videos. The best example of this type of social bookmarking site is Pinterest, the darling new site in the world of social media. Smart sales professionals have started to use social bookmarking sites for marketing. A lot of social media and search marketers use social bookmarking heavily because Google and other search engines take social under consideration when determining a site’s ranking. The more social links a site has, the better it ranks. Social bookmarking is an extremely valuable online marketing tactic that you should take advantage of. It poses a great addition to your social media and search marketing strategy. Plus, social bookmarking is extremely easy and straightforward to execute.